THE author in his youth resided in the district from which many of the ancestors of the people of Waipu hailed. There he heard many harassing tales of the cruelties and hardships inflicted upon the people during the eviction period in Scotland (1780-1840). Many shiploads of helpless people were sent into the wilds of America without funds or preparations of any character, but they trusted in God to rescue them. It was the custom in those days, and for many years afterwards, for the common people to select some suitable neighbour as their letter writer. In the author’s day the local schoolmaster happened to be their amanuensis, and upon the teacher’s removal the office fell to him. In this capacity he gradually came to know most of the private and public affairs of a wide district. He also corresponded on their behalf with many of their relatives scattered throughout the English-speaking world. Little did he dream in those far-off times that some day he would see some of the descendants of these people in America, Africa, Australia, and New Zealand. He first came to know of Waipu and its people from a Mr. D. McKenzie, of Roslyn, Dunedin, in the ‘eighties of last century. Mr. McKenzie was born in Nova Scotia and was one of the Waipu migrants. About the same time a Captain D. McLeod visited Dunedin as master of a ship chartered by the Shaw, Savill Co. The author had occasion to visit the ship, and found the Captain to be a Gaelic-speaking Nova Scotian. He made enquiries regarding Waipu and its people, said he came from St. Anns, Nova-Scotia, and was related to some of the Waipu people. Some time afterwards the Rev. D. McLennan was settled in Chalmers Presbyterian Church, Dunedin. Mr. McLennan had just come from Waipu, where he had been settled as minister for several years, and so he knew Waipu and its people well. D. H. Mclnnes, The Braigh, Waipu; J. A. Morrison, Waipu; J. McLean, Waipu; E. Campbell, Waipu; C. D. McDonald, Waipu; and M. Fraser, New Plymouth; all of whom were born in Nova Scotia and are fluent Gaelic speakers. . Some of them could relate events in Nova Scotia, Australia, and New Zealand with equal facility. In. addition to the above may be mentioned Mrs. Griffiths, an English lady, and wife of the late Rev. Mr. Griffiths, of the Congregational Church, who ministered to a section of the Waipu people during some differences in the Presbyterian Church. ; also the Rev. E. Andrews, M.A., lately minister in the Presbyterian Church, Waipu, the Rev. D.. D. Scott, of Onebunga, and clerk of the Auckland Presbyterery, and O. N. Campbell, Esq., Commissioner of Crown Lands, Auckland, who is a descendant of one of the original Nova Scotian settlers. Besides these, a large number of the New Zealand generation gave valuable information regarding events in early New Zealand times. 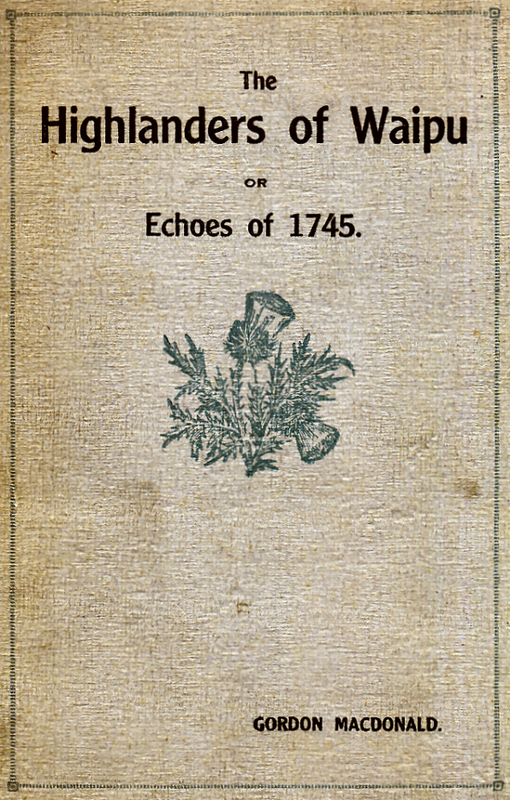 The Highland people are somewhat reticent in matters concerning themselves, and it is probable that had not the author known something of their history prior to their leaving Scotland, and had he not been able to converse with them in the native tongue, he would not have elicited much information from them. No consecutive story of the movements and experiences of these early settlers has hitherto been written. Fragmentary articles have appeared from time to time in the Auckland press. An anonymous pamphlet termed "The Idyll of the Ship-builders," Clark and Mathieson, Auckland, has been published, but it. is undated and unacknowledged. A book written by F. W. Wallace, Hodder and Stoughton, London, entitled "Wooden Ships and Iron Men," makes reference to the building of the ships at St. Anns, Cape Breton, but gives no details. 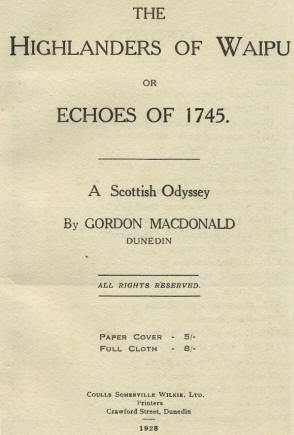 Mr. John R. McKay, Secretary of the Gaelic Society, Waipu, has written several articles in the local press descriptive of the district and the habits and customs of the people. Mr. J. D. McKenzie, Whangarei, began the writing of a book descriptive of the whole movement, but business and other reasons compelled him to abandon the work. Mr. J. Munro, Whangarei Heads, the diplomatist and politician of the settlement, compiled a list of all the families who took part in the migration, together with their designation and location in and around Waipu. From all these sources the author has obtained some information, and to all of them he begs to make due acknowledgment. In reading the story it will be observed that Christian Socialism had been the ideal of their leaders, both in Canada and New Zealand. This ideal, however, is fast disappearing, while the ordinary community life of the country is taking its place. Owing to the cost of publication in New Zealand and the trade anomalies surrounding it, the book has been curtailed; while some photographs, maps, and pictures have had to be excluded. The author receives nothing for all his labours, but he is anxious to keep faith with such of the people of Waipu as supplied the necessary information, though their support has been limited. It is well known that the Government of New Zealand assists in the publication of local works of an historic or scientific character. The Premier, when appealed to in 1926, willingly promised to assist in its publication; but when it came to action in 1927 he declined assistance without comment. Owing to the lapse of time and the different versions of the same incidents given by different individuals, it is possible that some errors may have crept into the narrative. Even so the story is well worth preserving, for it reveals one of the most courageous episodes in British history. The boundless trust in God of these people, their indomitable courage, their heroic perseverance, their devotion to their leader, and their final success, richly deserve a niche in the annals of our country. This issue is limited to 500 copies, most of which have been sold to friends abroad; the remaining copies are on sale in the shops of the Otago Bible Society, Dunedin, Wellington, Invercargill.— Price, 5s. The Sailing of the "Margaret"
Got a note in from Betty Powell, Genealogist at the Waipu Heritage Centre. Looking even fitter than he did 12 months ago, the chieftain of the Waipu Caledonian Society, Mr J J Finlayson, enjoyed the sports this week quite as much as any of the younger generation. Mr Finlayson was present at the first meeting held in William McKenzie’s paddock 62 years ago, and has only missed one gathering since. At present Mr Finlayson is engaged in collecting the history of “The Highlanders of Waipu”. 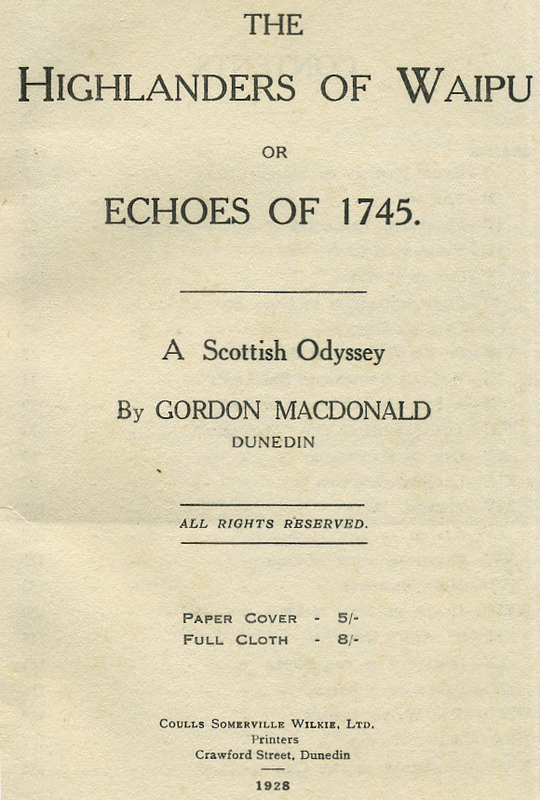 The author, the late Mr Gordon McDonald, of Dunedin, made a fine achievement of his altruistic task, but the difficulties of collecting and collaborating the history of the emigration were many. Mr McDonald never sent his manuscript to Waipu for correction, and a number of errors are said to have crept in. No one is better fitted to revise the work, the copywright of which is believed to have lapsed, than Mr J J Finlayson, who was born at Waipu 76 years ago. In his work of alteration and addition he is being assisted by Mr H S McKay, a retired schoolteacher.